August sales bounced back to nearly even with August ’09. Looks like the expired tax credit caused the decline in July. 646 properties closed through August, 17 percent more sales to date this year than last. 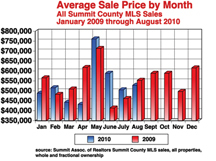 Average prices for all sales are even with last year to date but down about 13 percent for resale properties alone. There were a total of 2657 properties listed for sale last week as the inventory begins the seasonal decline. Chuck Leathers is the broker/owner of Chuck Leathers Real Estate Co. He can be reached at (888) 485-2300 or e-mail him at ChuckLeathers@Realtor.com.